Supplemental examination in Latin is required before completion of the first diploma examination if this subject was not completed satisfactorily with at least 10 credit hours at a higher-level secondary school. Supplemental examination in Greek is required before completion of the first diploma examination if this subject was not completed satisfactorily with at least 10 credit hours at a higher-level secondary school ("Oberstufe") after the eigth grade. VO Logic (compulsory module 3 lit. c, 2 hrs, 4 ECTS-Credits). (3) Before successful completion of the Studies Induction and Orientation Stage courses amounting to 21 ECTS-Credits may be passed. (1) The Studies Induction and Orientation Stage (STEOP), with a duration of one semester (30 ECTS-Credits), provides an overview of the study programme and its structure in order to give students an objective basis to assess their decision to pursue their chosen subjets. (3) A positive result (passing grade) on the examinations specified in Paragraph 2 permits students to attend all courses and take all examinations following the Studies Induction and Orientation Stage (STEOP) and to write bachelor's theses as described in the curriculum. The registration requirements specified by the curriculum must be met. The Diploma Programme in Catholic Theology offers comprehensive and specialised theological education conveying the most important theological issues, their approaches in the past and present and relevance for contemporary church and society. The main content of the programme is to impart advanced knowledge in selected fields of philosophy, in particular the core subjects of biblical, systematic and practical theology. 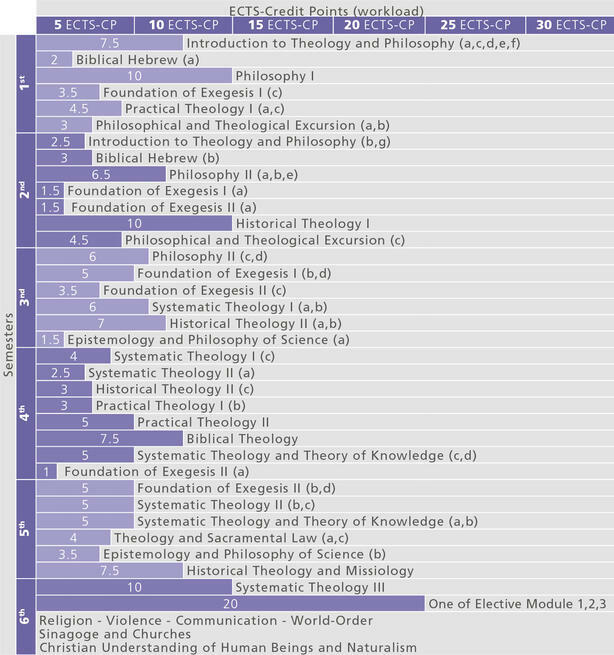 A special feature of the study programme is to give students an understanding of a majority of methodological approaches to the reality of God, man, and world. 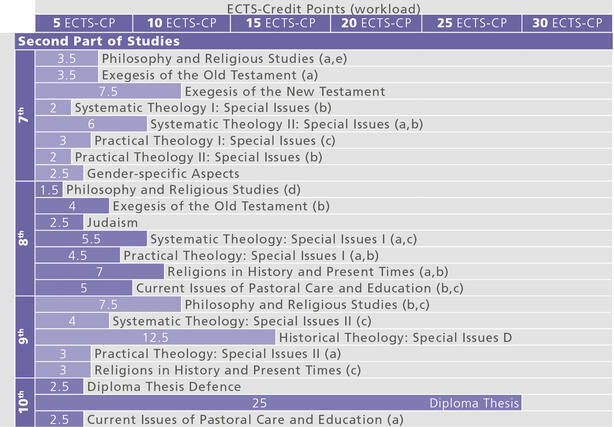 The School of Catholic Theology of the University of Innsbruck traditionally focuses on systematic-theological subjects. In additon to highly specialised knowledge, graduates acquire methodological skills in order to independently integrate and innovatively develop new issues. They possess a critical awareness which enables scientifically responsible dealing with faith and religion in public. The study programme promotes interdisciplinary skills and social communicative comptences of the students and qualifies them to recognize and transfer the unity of faith in its diversity of cultural expansion in new and/or unfamiliar contexts. Graduates are able to elaborate and implement theological issues and to manage relevant sources and literature. They are qualified to evaluate the ecclesiastical and social reality from the view of Christian faith and to reflect faith in the context of social reality. An integration of theological knowledge into their own personalities is to be achieved. social public activities which require special competence in ideology and orientation issues. By choosing the relevant elective module, students aquire the additional qualification of teaching religion in compulsory schools.